The subclavian vein is a paired large vein, one on either side of the body, that is responsible for draining blood from the upper extremities, allowing this blood to return to the heart. The left subclavian vein plays a key role in the absorption of fats and lipids, by allowing its products that have been carried by lymph to enter the bloodstream, where it can enter the hepatic portal vein. Their diameter is approximately 1-2cm, depending on the individual. Each subclavian vein is a continuation of the axillary vein and runs from the outer border of the first rib to the medial border of anterior scalene muscle. From here it joins with the internal jugular vein to form the brachiocephalic vein (also known as "innominate vein"). The angle of union is termed the venous angle. The subclavian vein follows the subclavian artery and is separated from the subclavian artery by the insertion of anterior scalene. Thus, the subclavian vein lies anterior to the anterior scalene while the subclavian artery lies posterior to the anterior scalene (and anterior to the middle scalene). The thoracic duct drains into the left subclavian vein, near its junction with the left internal jugular vein. It carries lymph (water and solutes) from the lymphatic system, as well as chylomicrons or chyle, formed in the intestines from dietary fat and lipids, allowing these to enter the bloodstream; the products of fats and lipids can then be carried by the bloodstream to the hepatic portal vein, and then finally to the liver, making it so that the left subclavian vein plays a key role in the absorption of these fats and lipids. The right lymphatic duct drains its lymph into the junction of the right internal jugular vein, and the right subclavian vein. As the subclavian vein is large, central and relatively superficial, it is often used to place central venous lines. Sub (below), and clavian (pertaining to the clavicle). Paget–Schroetter disease includes the thrombosis of the subclavian veins, in this case usually caused by exercise-induced strains. 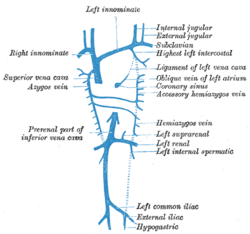 The venæ cavæ and azygos veins, with their tributaries. The thoracic and right lymphatic ducts. The thymus of a full-term infant, exposed in situ. ^ "Subclavian Vein Anatomy, Function & Location | Body Maps". Healthline. 2015-03-20. Retrieved 2019-01-03. ^ "What is the Subclavian Vein? (with pictures)". wiseGEEK. Retrieved 2019-01-03. This page was last edited on 21 January 2019, at 19:34 (UTC).